Sorry, Disposable E-Cigar (Single) has been discontinued. Disposable Electronic Cigar, equivalent to 12 regular cigars. this eCigar combustion and tobacco free vapor that tastes and looks like the real thing. 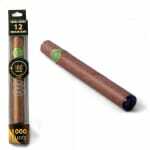 Our disposable e-Cigar provides more than 1000 puffs of high quality cigar-flavoured vapour - more than 12 regular cigars! They look and feel exactly like a traditional cigar, but, unlike a traditional cigar, they do absolutely no burning, and contain no tobacco and no nicotine. Each e-Cigar comes fully charged so you can just open the box, remove the freshness seal, and start enjoying it right away. Each e-Cigar can last for weeks or even months, depending on your usage, proviging the physical sensation and pleasure of traditional smoking but with none of the bad smell, burning, smoke, carcinogens or ash. I've tried out e-cigars in the past, and I found the authentic taste of this brand to be quite addicting! Kinda bummed they don't have nicotine content, but around the wife and kids its a great substitute! The taste of these cigars is pretty good, almost like a cuban cigar, but I just wish they had nicotine. Still a great disposable to share around the poker table, and isnt bad for my kids. got a whole bunch of these disposable e-cigarettes for my best friends wedding. We had 4 smokers in the wedding party. The whole weekend, there was NOT A SINGLE cigarette smoked. now thats amazing. my first party where i was at ease the whole night. i hate the fact that so many of my friends and my partners smoke. one of them has since switched to e-cigarettes and the bride quit cold after this gesture. I bought one just to try it out and I was actually very surprised by this thing. It lasts for ever, took me a whole week to finish it. Vapour volume and taste are amazing! Just to bad that you can't get them with nicotine, be non the less a fun thing to have. Got a soft mouth piece as well, feels like the real deal. I purchased this e-cigar as my doctor suggested I slow down on my cigar smoking. I am so used to puffing. I tried 180 Smoke on recommendation of my neighbor. He heard it from his boss. After some research, I decided to purchase one of these e-cigars. I initially did not like the taste. i guess I wanted that taste which i now consider to be harsh. After a few days, i got into the taste and now go though about one every 2-4 weeks depending on usage. If you are a cigar smoker like me who had cigar as his routine which then i guess turned into a regular habit, then you may want to try it out. take a few days to judge the taste.